Two studies regarding the escaping atmospheres of hot exoplanets have been published this month in the journal Science (1,2). The first is a transiting warm Neptune-mass exoplanet located 20 times nearer its host star than the Earth is to the Sun. The tail of helium being blasted away from this planet by radiation from its orange dwarf host star extends some five planetary radii out. The planet, known as HAT-P-11b, is blown up like a helium balloon, according to the researchers who have been studying it (3). However, HAT-P-11 is not a young star still blasting away at the primordial atmosphere of a new Neptune-sized world, as you might expect. Instead, HAT-P-11 is 6.5 billion years old; almost 2 billion years old than our own Sun. So, why is it still managing to have such a devastating effect upon the Neptune-sized exoplanet in its midst? Common sense would dictate that you can't have such an effect going on for 6.5 billion years, as the planet would have been eradicated long ago. Loosely bound helium held in this gaseous 'envelope' would surely leak out into space in considerable quantities over time? Like with comets repeatedly transiting around their stars at perihelion, you would think that at some point the volatile gases would all get blown away. Perhaps HAT-P-11b was once a much greater hot Jupiter world which has shrunk to Neptune proportions over time. 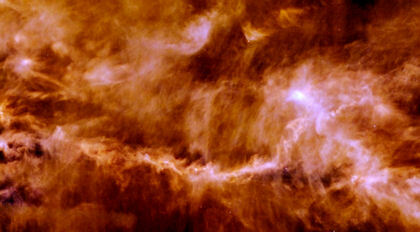 Or, perhaps this is a case of inwards migration of this world from further out in the star system. A similar tail of atmospheric helium is being blasted back from another giant exoplanet, this time known as WASP-69b (5). This world is about a quarter of the mass of Jupiter, making it a sub-'hot Jupiter' object. The discovery of this helium tail was also made using the Carmenes instrument, installed on the 3.5-meter telescope of the Calar Alto Observatory in Spain. In this case, the host star, is 2 billion years old and just a little smaller than our own Sun (6), making it another orange dwarf. So, again, this effect isn't due to the young nature of the system - there is a sustained effect taking place over a long period of time if the system has been static for that entire time. 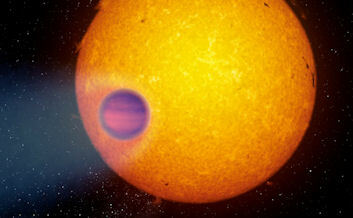 How long can such helium leakage be sustained from this 'evaporating exoplanet'? Previous discoveries of such leaking exoplanets have included a 'hot Neptune' planet whizzing around a ~9 billion year old red dwarf, Gliese 436 (7). Evidently, these hydrogen and helium 'envelopes' can be remarkably long-lasting. But that is not always the case. 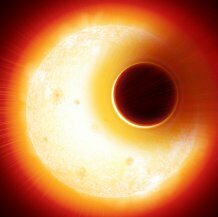 Other 'hot' Neptunes may shed so much atmospheric material that they end up as smaller planets. This is thought to be the case for the hot Neptune planet GJ 3470b, whose superheated atmosphere is evaporating off at a rate 100 times faster than that of Gliese 436b (8). During its 2 billion lifetime, it may already have lost a third of its mass to the radiation pressure of its star, and within several billion more years, it could be left a mere rocky, terrestrial world (one would assume that as the planet loses mass, the process of atmospheric evaporation would accelerate - there is less gravity to keep it held to the bombarded world). The knowledge that GJ 3470b is losing its atmosphere so quickly suggests that other hot Neptunes may have eroded down to smaller, rocky super-Earths. This effect might then explain a the relative dearth of such objects among exoplanets (9). 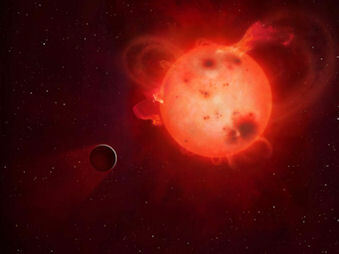 Smaller exoplanets which have been discovered close to their parent red dwarf stars also seem to have been shorn of their atmospheres by powerful flares and coronal mass ejections - a phenomenon which red dwarfs seem quite prone towards (10). Why is this important? Because it indicates that planets can appear like comets, under the right circumstances. The volatile gases wrapped up in the atmospheres of Neptune-sized worlds can become drawn out into what must be rather fabulous looking envelopes of gas. These effects are being noticed in the specific cases of exoplanets which are located very close to their stars. This is reasonable in the sense that the planets are subjected to the ultraviolet radiation and stellar winds at this proximity. But, the reason we're seeing this in these cases is that the planets are transiting the stars, allowing measurement of their extended atmospheres to be taken. That creates bias towards very close planets. It may also be true that Neptune-sized planets located further out from these orange and red dwarfs could be exuding atmospheric hydrogen and helium. Observational bias dictates that we only see the effect with their closer exoplanetary cousins. This potentially means that Neptune-sized worlds on eccentric, comet-like trajectories might be highly spectacular in nature during their perihelion passages - true cometary planets. 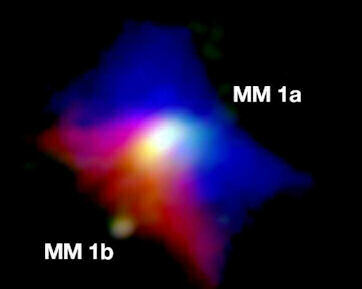 There's evidence to suggest that all stars begin life in a binary litter, known as a 'dense core' (1). Many of these binary units remain intact, providing the universe with a steady supply of binary stars. Others seem to break apart, flinging the companion object into interstellar space - a rejected runt left to fend for itself within the galactic streams. Spotting binary stars which have relatively similar masses is easy enough. What is less clear is whether tiny companion objects, formed within these dense cores, set up shop within planetary systems, hiding beyond out sight within the outer darkness of their sibling star's system. A directly imaged example of such a system has been reported this month, which amply illustrates the potential for such companion objects. A young massive star, forty times more massive than the Sun, has been found to have a companion star in orbit around it whose own mass is about half that of our Sun (2). This means that this young binary pair has a comparative mass ratio of 80:1 (3). Now, if we were to bring this down to a star system where the main star was the mass of the Sun, its companion object would be be an 1/80 of the mass of the Sun. Such an object would be about 13 Jupiter masses, which is at the lowest mass range from brown dwarfs. The implication of this is that our Sun might have spawned a low mass brown dwarf during its formation. This may be a bi-product of the spinning disk as the primordial disk collapses under its own gravity (2), or, alternatively, the result of a spindling effect due to a passing star within the stellar nursery, as suggested by François Berguerand (4). It's likely, I suggest, that such disparate binaries are common. In effect, they could have been the precursor for each 'single' star we see in the sky. After the initial paring form, the companion is either lost to interstellar space, or becomes loosely bound within the outer reaches of the star system. Perhaps, in some cases, it erodes over times due to its ongoing proximity to the main star blasting away at its atmosphere with ultraviolet radiation. 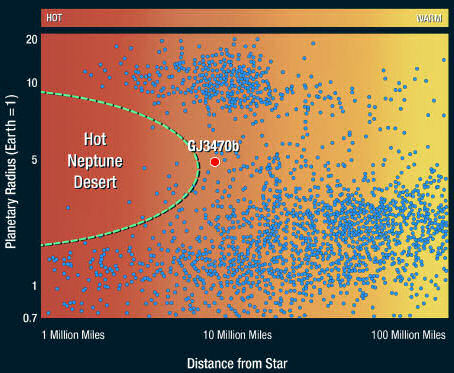 This appears to be the case with certain 'hot' Neptune exoplanets, as discussed in the blog piece above (5). Conceptually, this would support the notion that many brown dwarfs occur in situ within much more massive star systems, rather than independently in interstellar space. A new survey of protoplanetary disks in the star-forming region in the constellation Taurus have determined that a considerable proportion of the planets emerging from these young disks are super-Earths and mini-Neptune worlds (1,2). This is in keeping with the high incidence of super-Earths and mini-Neptune worlds among the known exoplanets, and helps to confirm the ubiquitous nature of these worlds. The survey picked up many fainter protoplanetary disks, which removed some of the observational bias previously favouring the discovery of disks containing more massive, Jupiter-sized worlds. "The [international] team measured the properties of rings and gaps observed with ALMA and analyzed the data to evaluate possible mechanisms that could cause the observed rings and gaps. While these structures may be carved by planets, previous research has suggested that they may also be created by other effects. In one commonly suggested scenario, so-called ice lines caused by changes in the chemistry of the dust particles across the disc in response to the distance to the host star and its magnetic field create pressure variations across the disk. These effects can create variations in the disk, manifesting as rings and gaps. So, super-Earths continue to be the most populous exoplanet category, both in terms of known objects, and the spread of dusty rings they emerge from. This, despite their seeming absence within our own solar system. 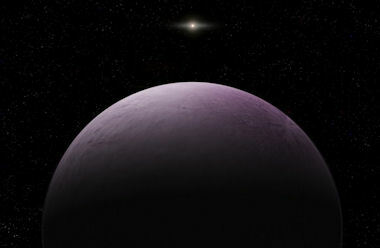 Farout is the nickname that has been given to a new dwarf planet which is the furthest solar system object to have been spotted yet by telescopes. An international team using telescopes in Hawaii and Chile have determined that this slow-moving scattered disk object, known officially as 2018 VG18, is located somewhere between 125 and 130 Astronomical Units away (1). As a result, Farout's orbital period is over 1000 years long The object is pinkish, spherical in shape, and probably about 500 km across (2); but at this distance it's difficult to say much more about it. The gap between the Kuiper belt and the inner Oort cloud (IOC) is starting to pick up a decent population of objects. Depending upon their perihelia and aphelia distances, inclination and other orbital properties, these extreme trans-Neptunian objects (ETNOs) might be compartmentalisable into different groupings. As objects in the solar system are being increasingly understood to have had a dynamic history, migrating from position to position over time due to complex perturbing effects during the lifetime of the solar system, it's reasonable to wonder whether objects out in this no-man's land might once have been cometary objects that originated from the IOC which migrated inwards, or, alternatively, Kuiper Belt Objects (KBOs) which have been scattered, or drawn, outwards. The presence of a massive Planet X object could have manifested both of these possible routes. Further, the massive perturbing object could also play a shepherding role; organising the distant dwarf planets into a orderly dance troop which share common arguments and longitudes of perihelia, which remain stable over long time periods. This shepherding effect, if it is real, seems the most likely reason for the observed cluster, and the more objects that are found to fit into this emerging pattern (countered by those that don't), the stronger the statistical evidence for the existence of Planet X. 2018 VG18 may turn out to be another one of those objects, but to find that out we will likely have to wait until the incredible scoping power of modern astrophysics increases once again, as the next generation of telescopes comes online. Following its remarkable flyby of Pluto in 2015, the New Horizons probe has been winging its way into the Kuiper belt, seeking out objects to image as it goes along. At the time of writing, it is fast approaching the first such Kuiper belt Object, 2014 MU69, which has been nicknamed Ultima Thule. On New Year's Day, New Horizons will approach Ultima Thule at a distance of just 2,200 miles, which is a third of the distance it achieved with Pluto. However, this time the reddish object being studied is just 19 miles across, making it a tricky target to focus upon as the probe whips past in the darkness of the Kuiper belt. ""It's possible that Ultima's rotation pole is aimed right at or close to the spacecraft," said Marc Buie, also of the Southwest Research Institute. That explanation is a natural, he said, but it requires the special circumstance of a particular orientation of Ultima. ""Another explanation," said the SETI Institute's Mark Showalter, "is that Ultima may be surrounded by a cloud of dust that obscures its light curve, much the way a comet's coma often overwhelms the light reflected by its central nucleus." That explanation is plausible, Showalter added, but such a coma would require some source of heat to generate, and Ultima is too far away for the Sun's feeble light to do the trick. The potential presence of a building yard of rubble and dust surrounding 2014 MU69 creates great danger for New Horizons. In classic Star Wars style, it may be about to plunge into a mini-asteroid belt - of sorts. Without the ability to weave through this potential field of debris like the Millennium Falcon, the fragile probe may be lost to collision. As a member of the 'cold classical' category of objects in the Kuiper belt, 2014 MU69, moves along a relatively circular orbit around the Sun, with a low inclination to the ecliptic plane. Time will tell as to whether that classic behaviour runs true for its other properties. 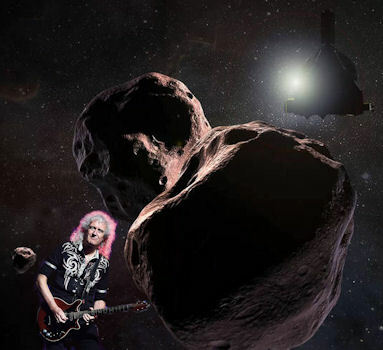 Meanwhile, here on Earth the flyby will be celebrated in rather unconventional style, with the release of a music video about Ultima Thule by Queen guitarist and PhD astrophysicist Dr Brian May. You can catch a sneak preview on his blog (2). I had a bizarre alien encounter at the start of this month. Not on a distant, secluded mountain. Not at a top secret research facility in an American desert. No, it occurred a the most unlikely location: the English town of Reading. Four stranded aliens from the moon LV-426 (located out in the Zeta II Reticuli system) have successfully integrated into the human city of Rome (could be worse...!). They while away the time knocking out some banging metal tunes. These Italian aliens may be 39 light years from Earth, but their creative juices remain undimmed.